The toucan, with its conspicuous and brightly-colored bill, is one of the most recognizable birds on the planet. There are more than 30 species of toucans that vary in size and color patterns. The piercing vocalizations of these birds can be heard throughout the rain forests of Central and South America. The Toco toucan, the largest toucan species, measures approximately two feet, which makes it twice the size of the tawny-tufted toucanet, one of the smallest varieties. Toucans generally have a black plumage that contrasts with their brightly colored throats and faces. The colors of the bill vary and are reflected in the names of several species, such as the chestnut-mandibled and black-mandibled toucans. The most colorful bill is that of the keel-billed, or rainbow-billed toucan, which is mostly green with red, blue and orange parts. Though large, the bill of the toucan is mostly hollow and light. Its wings, however, are heavy, which makes the toucan a clumsy flyer that prefers hopping from branch to branch. The tongues of toucans are long and narrow and lined with bristles that help them swallow food. While toucans can be found throughout the rain forests of Central and South America, each species has a more limited range. The keel-billed toucan, Belize's national bird, may live from southern Mexico to northern Colombia and northwestern Venezuela. The Choco toucan is found in the region of the same name along the coasts of southwest Colombia and northwest Ecuador. The black-mandibled inhabits mountain rain forests in Venezuela, Colombia and Peru. The white-throated toucan and the channel-billed toucan are common throughout the Amazon rain forest. The latter also occurs in the coastal rain forests of Brazil. Toucans rarely descend from the rain forest canopy. The exception is the Toco toucan in eastern South America, which can be found on the edges of forests and in wet grasslands. Toucans are omnivorous, which means they eat both plant and animal matter. Their diets consist mostly of fruits, including figs and wild cherries, which they swallow whole. They will also eat lizards, tree frogs, insects and even the eggs of other birds. Toucans inadvertently help plant new fruit trees: the seeds they consume often pass whole through their digestive systems and sprout where they land. Toucans mate in the spring and usually remain monogamous for the duration of the breeding season. As part of a mating ritual, the male and female may use their bills to toss fruit to each other. The female lays one to five eggs inside a tree hole and both parents help keep them warm. Featherless chicks hatch two weeks to 18 days later, but do not open their eyes until they are approximately three weeks old, which is also when their first feathers appear. Chicks remain in the nest for up to eight weeks, during which time their bills develop. Toucans are social birds; they travel in flocks of up to 12 individuals. 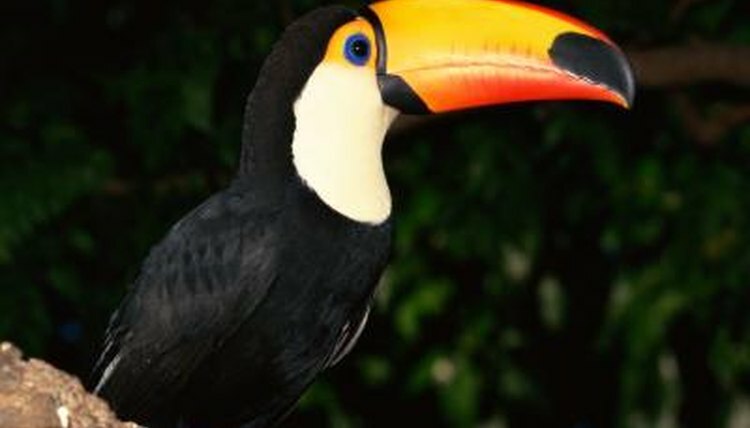 When it comes to vocalizations, toucans are divided into two groups: "croakers" and "yelpers." Croakers, which include the channel-billed toucan, emit frog-like sounds; yelpers, such as the white-throated, chestnut-mandibled and black-mandibled toucans, produce sharper cries that carry farther.